We were given a family ticket to visit SS Great Britain while on a weekend break to Bristol. This is an old iron ship; built by Isambard Kingdom Brunel that first sailed in 1843. The history of the ship is simply quite fascinating; a wonderful educational experience for the young and old alike. What is the SS Great Britain? SS Great Britain is in a dry dock within Bristol Harbour. Amazingly, the boat was built by Brunel, starting in 1839, and completed in 1843. During the construction, there was a significant accident, with the two key engineers killed, and Brunel severely injured. Its history has remained incident-strewn ever since. When it set sail, it was, of its time, the most state of the art boat in existence. It continued in service until 1933, when it was abandoned in a beach off the Falkland Islands. It was finally brought back, 8,000 miles across the atlantic, to Bristol on the anniversary of its birth in 1970; 127 years after it was first launched on July 19th. 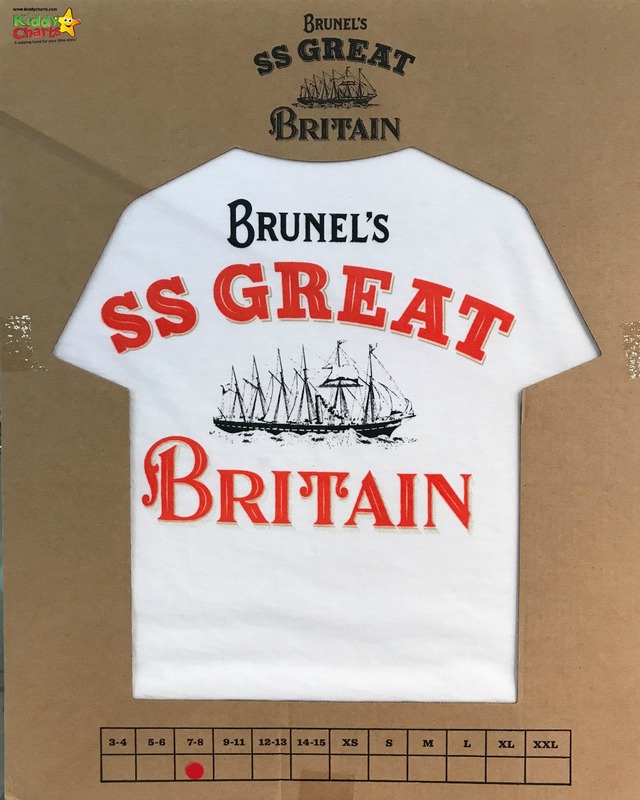 Well, they have done a stunning job of it; both the SS Great Britain, and the museums and displays that show the life of Brunel are nothing short of astounding. We have visited a lot of museums, and the only one that beats it, according to my kids, was NASA’s Space Centre in Cape Kennedy. Now THAT is high praise indeed. Tickets for the attraction are £16.50 for adults, and £9.50 for children, with under 4s for free. There are family tickets for £45. What is there to experience within the SS Great Britain museum and site? We were wrong about this site; we thought it would take about 2 hours to get around it; but we were there before and after lunch, and we still didn’t see everything that was available to visitors. In total, we were on site for 4-5 hours, and still had to rush to finish! Make sure that you allow plenty of time to visit; you really will need it. 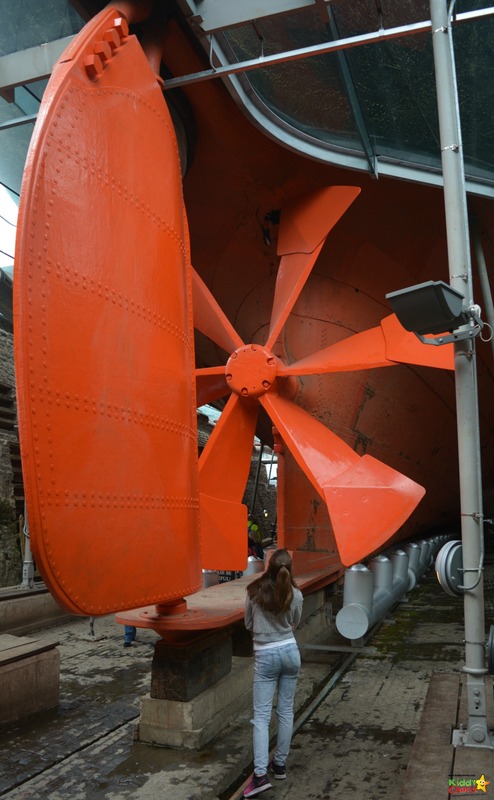 You are encouraged to start your journey looking at the Dry Dock that the SS Great Britain is now moored in. Huge machines (named Deep Thought I (inside the ship) and II (in the dock) keep the moisture out of the atmosphere so that the elements don’t ruin the boat. The whole undertaking is incredibly impressive, and shows the dedication of the conservation officers and the museum in preserving this hugely important slice of engineering history. You are able to walk down, effectively under the surface of the water, to see the hull of the board from the outside, including “the crack” that threatened to snap the boat in half before it was retrieved from the Falklands all those years ago. Following a visit to the dry dock, you move into the Dockyard museum. This museum takes you on a timeline trip through the history of the SS Great Britain…. …and there is plenty here to make you smile too. The museum brings the history of the ship to life with interactive exhibits, including a fabulous ship’s wheel, and some gorgeous films, alongside parts of the original ship. 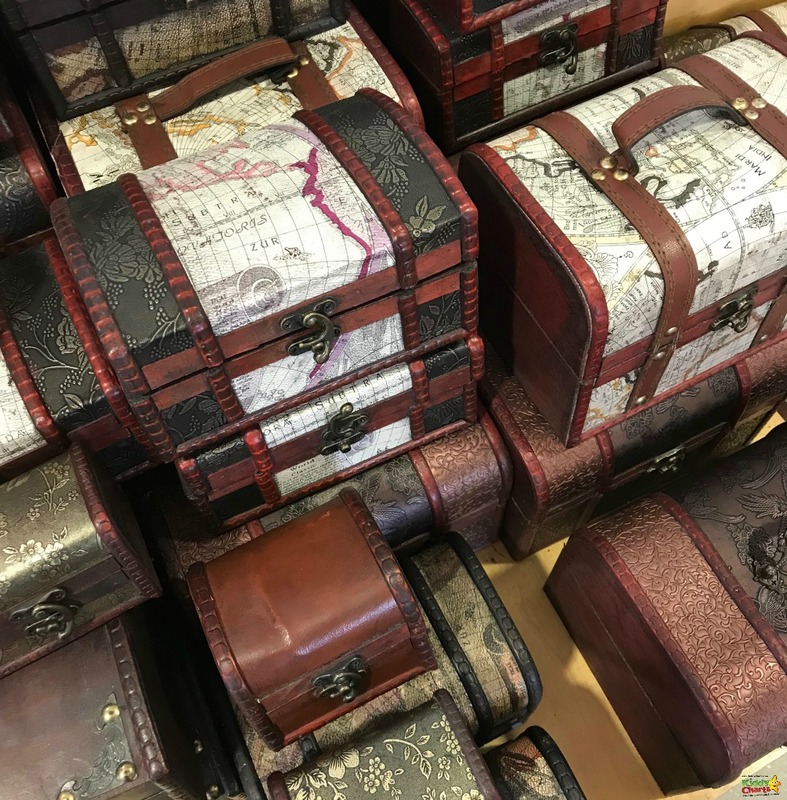 The most original idea are the Global Stories; which really help kids and adults alike to understand what life was like on the ship as it crossed from the U.K. to Australia. There is huge collection of real life stories from those that traveled on the boat, and you are able to search the Global Stories database to see if there was anyone travelling that was just like you. The kids loved looking at this, and were fascinated by the lives of those spending two months emigrating for a new life. After searching the database, you are invited to pick a boarding card to take on board the ship itself. There do seem to be only a few women available though – we found just three, which is probably why so many of the cards had already been taken by the time we got there in mid afternoon! Maybe get a few more women for those that want, SS Great Britain? 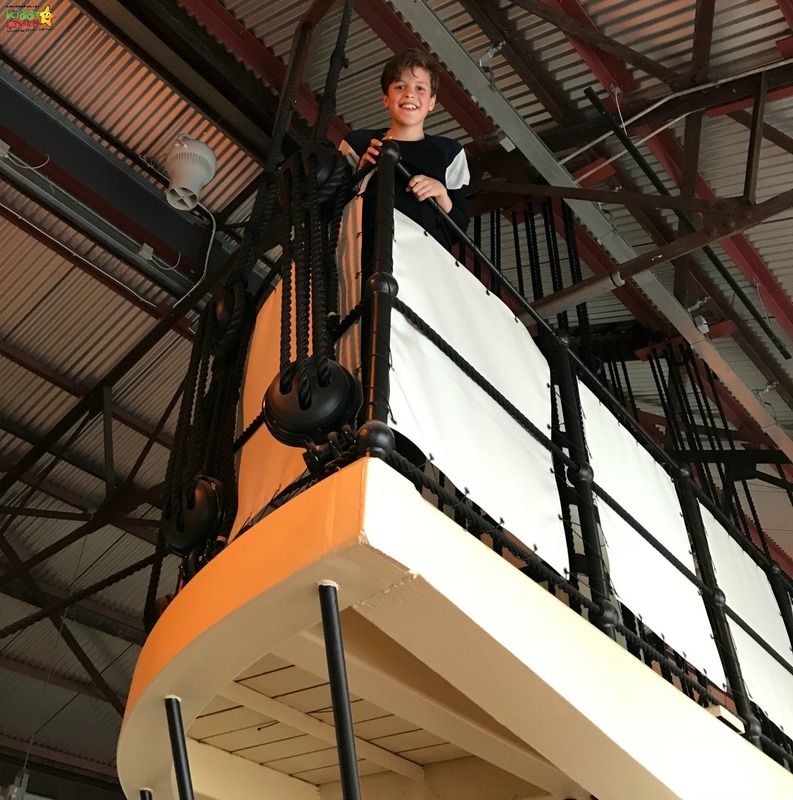 Once you have your card, it is time to step aboard the ship, and just as there is so much to learn in the museum, and the dry dock, the ship itself is equally immersive, allowing you to experience, the sights, sounds, and even smells from the 19th century. There are even rats in the kitchen! 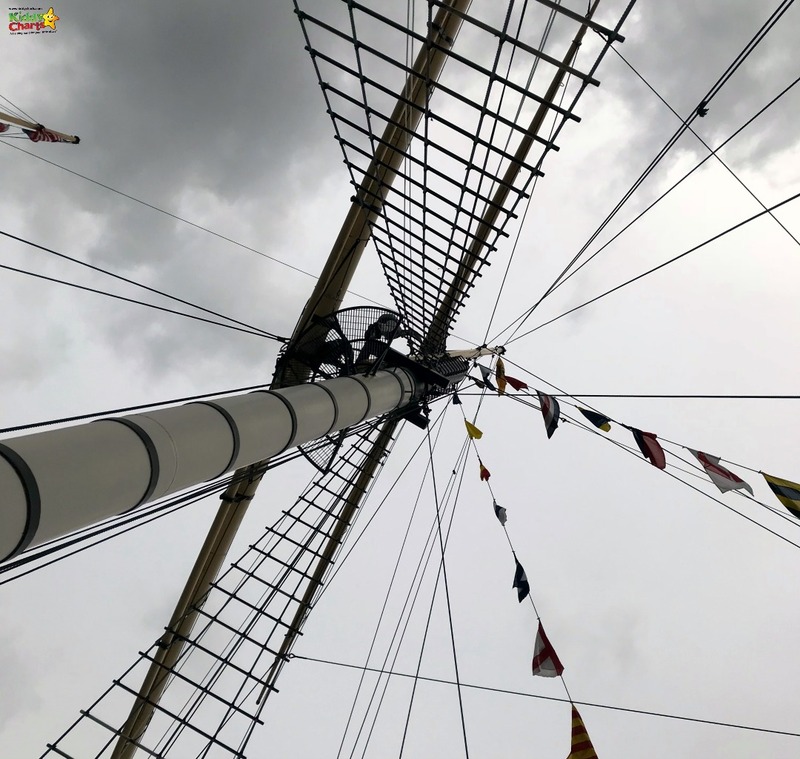 On the deck, the views of the city are stunning, and for those that have the nerves, you can climb up the rigging with Go Aloft so you can see what it felt like to be a cabin boy all those years ago. This is the Go Ape of the Shipyard! The kids were given a harness, and instructions, and sent up to the crow’s nest for £10 each. Great value for an experience that teaches so much. 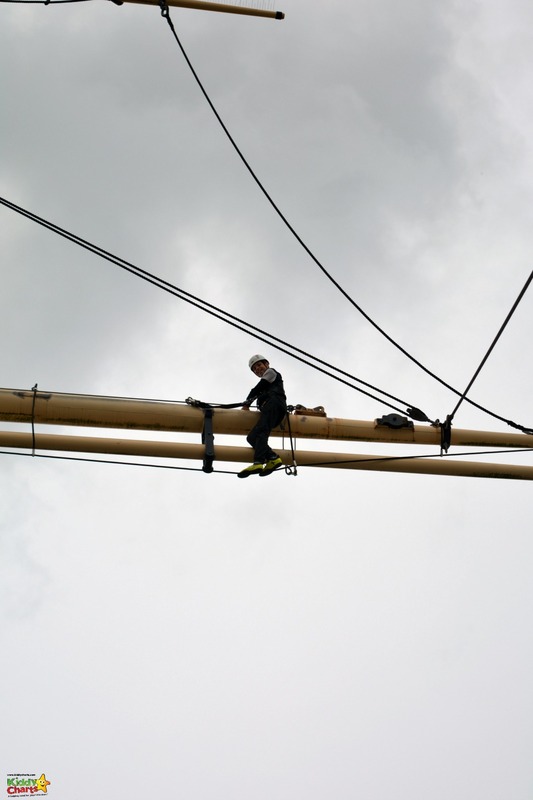 It doesn’t take too much imagination to realise that climbing the rigging with no harness, in the dark, and on the high seas, must have been a terrifying experience for the crew when the boat originally set sail in 1843. Thankfully the kids had that harness to keep them safe…. 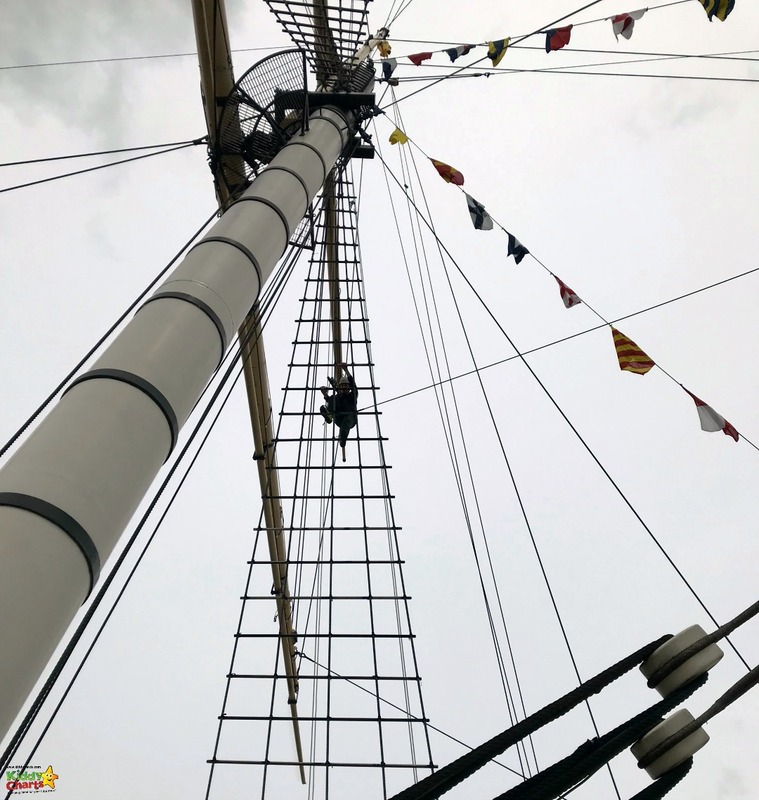 Our kids thoroughly enjoyed this experience, with Stuntboy embracing it and marching along the mast to the end, while Chatterbox was a little calmer; being happy to stay on the Crow’s Nest and watch her brother’s daring feat! 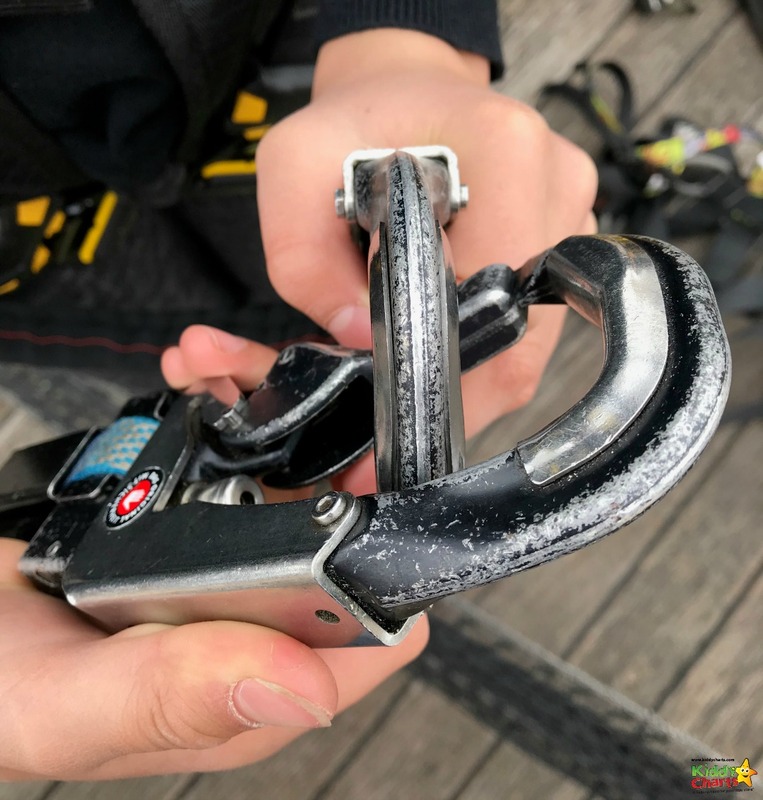 Such a great idea to add even more action to your day with the kids – Stuntboy wanted to do it again! It was actually quite tempting to let him as well, as it was so much fun watching them – though we were rather grateful that our feet were firmly on the ground while we did it! Under the weather deck, there are the lower decks, including the engine room; which has a huge replica of the steam engine which powered the boat in Brunel’s time. 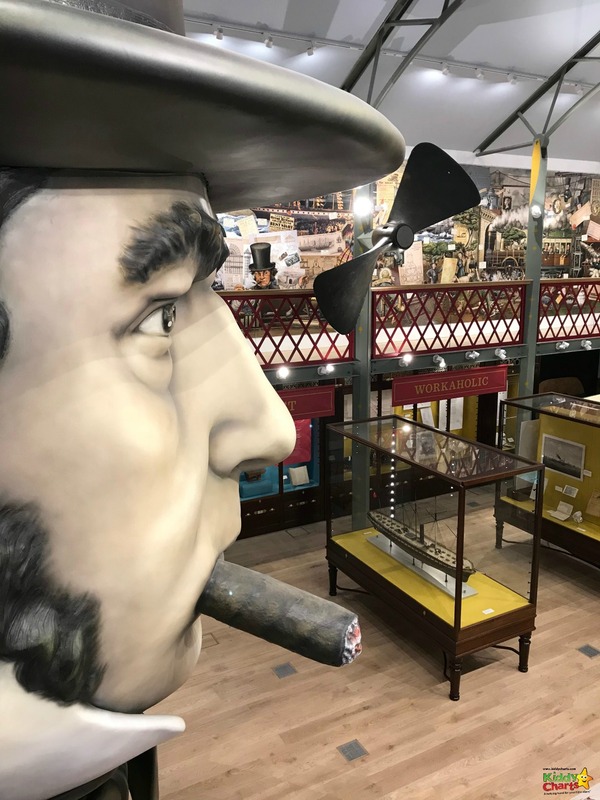 It is even possible to explore the hull; there are a huge number of mannekins, models, recordings, and smells will continue to excite the senses. More for the kids to love in fact; and ours very much did! 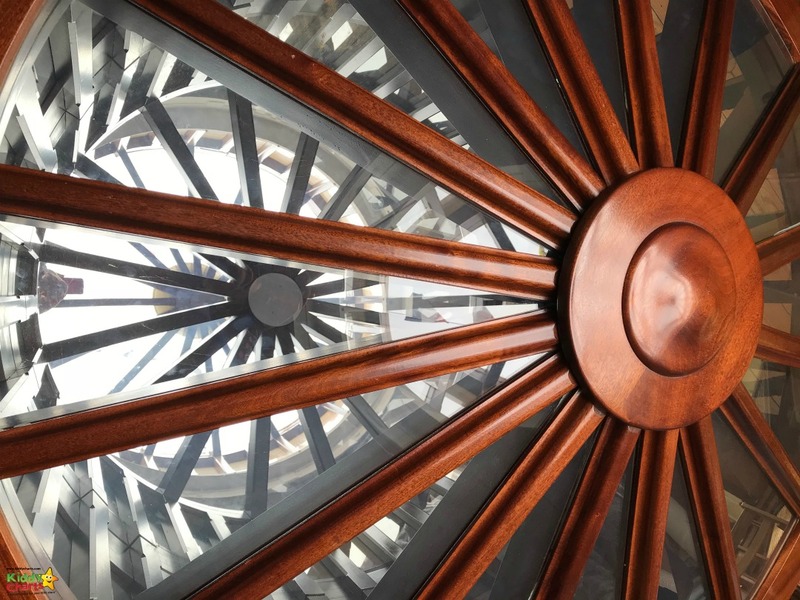 There are so many wonderful details on the ship…it is a photographers paradise. It is possible to spend hours just exploring the rooms onboard, and using the camera’s eye to find some excellent details from the ship’s time on the seas. 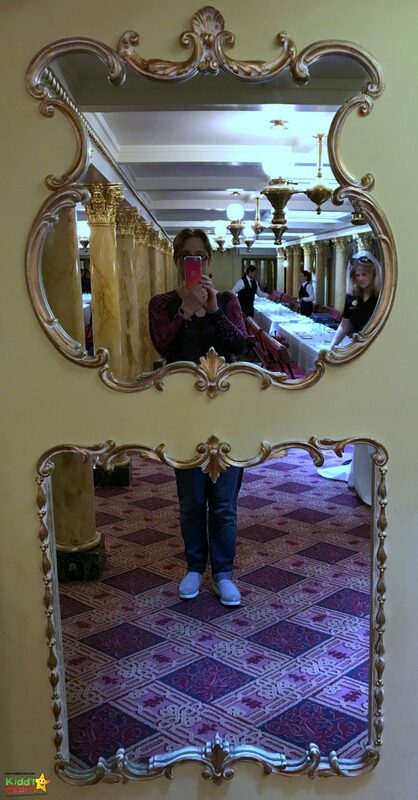 These mirrors made me smile too – help – we got cut in half! The decor in some of the rooms was glorious; – the above photo was taken in the main dining hall, which was being set out for a wedding while we visited; what a place to get married! Following the visit to the ship, you can enter the Being Brunel exhibition, which is on the side of the docks, just next to the ship. We expected to make a short stop here before leaving, but managed to get side-tracked for over an hour! This exhibition shows different sides to Brunel’s life; from his creativity and artistry, to his engineering mastery and entrepreneurial nature. Even people during his lifetime were fascinated by his projects; with many stunning items created to commemorate his projects; including this stunning souvenir…. Overall, the exhibits were superb, and highly engaging for the kids; from understanding why Brunel’s rail tracks were so important, to seeing inside his mind (through a film); and even a near-holographic representation of the London to Bristol railway line. This exhibit, was complete with Brunel’s “hand” sketching his engineering contributions to this important artery within the country. There are even Top Trumps for some of the amazing engineering projects he created for you to play with as well! Even the characters working in the Dock Office are presented in such a beautiful, and engaging way, they are worth a photo.. When we agreed to review this, we did not expect to be able to write over 1,700 words on the experience! This is by far the best museum we have been to with the kids; from the imagination of the interactive exhibits, which really use technology brilliantly, to the small touches to keep kids interested. For example, the Top Trumps in the Being Brunel exhibition, and the boarding cards in the Dockyard museum. It really is no surprise to learn that it has been given so many awards since it opened. Even the shop is a cut above the rest, with imaginative products. 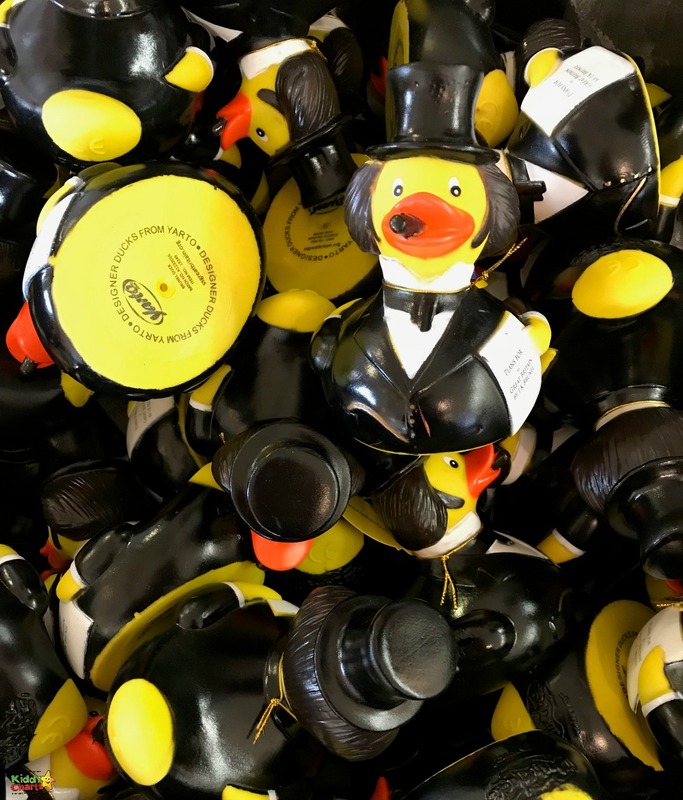 We fell in love with the Brunel rubber ducks…. There are so many iconic, vintage brands, alongside these nik-naks too, with plenty of educational resources to capture the imagination. There is a lot of fun to be had on the docks when you are done – if your kids like that kind of thing! So, if you are in Bristol with the kids, you quite simply HAVE to visit this museum. You would be totally bonkers not to give it a go. If you like this article; do check out the other articles within our travel writing, and why not subscribe to us too, so you don’t miss anything; we provide free printable resources, giveaways, reviews, tips, and info on family travel. Some there really is something for everyone.